Cor-Pak Pouches each protect one cubic foot of enclosed space. These small (2.5" x 2.5") Tyvek® membrane pouches allow VpCI® molecules to reach and protect the surrounding metal surfaces including recessed and inaccessible areas. 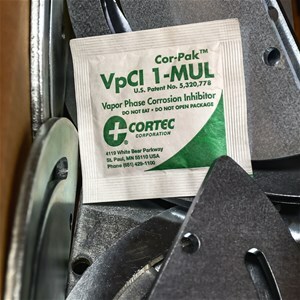 Cor-Pak 1-MUL Pouches are designed to product products, components or assemblies when packaged in corrugated boxes, plastic wrap or bags, and wood or metal containers for up to 24 months. Cor-Pak pouches provide a dual desiccant and VpCI protection. NSN# 6850-01-470-2737. Approved under military use under GSA #8030012081769. 300 units per carton. Carton weighs 2 pounds. Cortec Product Code 10500016.